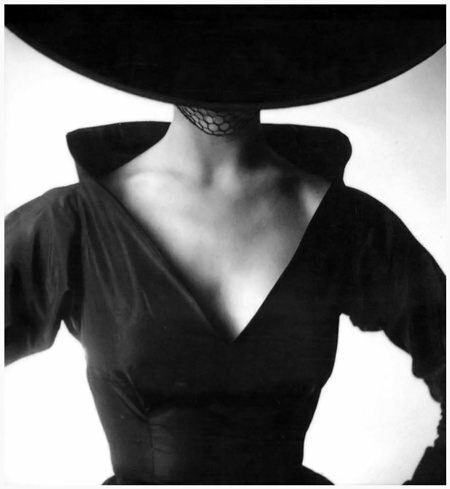 Irving Penn said, “I can get obsessed by anything if I look at it long enough. That’s the curse of being a photographer.” A curse perhaps, but one that Penn put on himself, not one that was placed upon him. Irving Penn was one of the most famous American photographers, yet he started his graphic career as an Art Director, but leaving his position and taking up the camera as he was not satisfied with the photographs he was sent by the so-called professionals. He showed that he could handle all formats and is probably best remembered for his stark black and white fashion images. He had an eye for photo and design that was unique, so it is worthwhile spending a little time looking at this great man and his works. He was born in 1917 in Plainfield, New Jersey. Realizing early that his talents lay somewhere in the artistic world, he enrolled at the age of 17 in a four year course at the Philadelphia Museum School of Industrial Art, where he trained for a career as an Art Director. At this stage he had no thoughts of becoming a photographer. He began being the office boy and apprentice artist for Harper’s Bazaar magazine drawing shoes, and worked his way up from there. After graduation he had positions as an Art Director, but he was not happy or convinced that this was all that life was going to offer him, so he went to Mexico for a year to devote himself to painting. One year convinced Penn that he was not going to make it as a painter and he returned to New York and took a job with Vogue magazine as a junior Art Director. His work was noticed by the senior Art Director, but the staff photographers could not deliver the pictures that Penn saw in his mind, encouraging him to take the photographs himself. This was the start to a great career. He continued with Vogue, with just a small break for the war effort, and his first exhibition of magazine covers was held in 1947 at the Metropolitan Museum of Art in New York. For me, his work is unique because of his use of light and other devices to isolate his subject from the background. One example of this was his series, taken against a totally plain background, of workers in their working clothes with their tools of trade being the main item to lead the viewer to the industry concerned. He was also the master of side lighting to produce a dramatic atmosphere to his photographs. Look at many of his photographs taken against a neutral background, emphasizing the subject. These are true Art Director material – but Irving Penn was an Art Director who could take the photograph as well. His use of photographic equipment was also very varied. Since he would envisage a shot before he took it, he would then work out what he felt would be the best equipment to use to produce the shot. His formats were also varied, from 35 mm Leica and Nikon, through to medium format (6×6) Rolleiflex or Hasselblad and then all the way through to giant 8×10 Deardorff plate cameras. His talents did not go unnoticed. He was voted as one of the top ten photographers in the world in 1958 and has had his work exhibited internationally as well as at some sell-out shows in his native America. Included in these are those in the Museum of Modem Art, the Metropolitan Museum of Art, the Addison Gallery of American Art, the Baltimore Museum of Art and at the Museum of Modern Art in New York (1975) and at the Metropolitan Museum (1977). Published books include ‘Moments Preserved’ (1960), ‘Worlds in a Small Room’ (1974) and ‘Flowers’ (1980). Irving Penn and his extraordinary capacity for work, versatility, inventiveness, and imagination in a number of fields including editorial illustration, advertising, photojournalism, portraits, still life, travel, and television, is someone who truly was a “Master Photographer” and studying his work one wet afternoon will go a long way towards improving your own photography. He died in 2009 at the age of 92 and his works are still being exhibited through the Irving Penn Foundation.